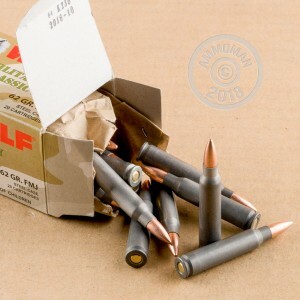 Visit an outdoor shooting range and you may see someone using steel-cased .223/5.56 ammo like these Wolf rounds in their AR-15s. 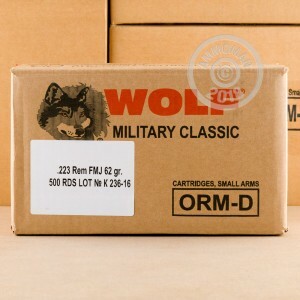 Wolf rounds like those in this case of 500 deliver a good shooting experience at a reasonable price. The lacquer coated steel cases, although not reloadable, feed and eject well and cost considerably less to make than brass cases. Made in Russia, these cartridges use non-corrosive Berdan primers. These rounds use a 62 grain bimetal jacketed bullet with roughly comparable ballistics to M855 ball ammo. This ammo does have magnetic properties, so it may not be allowed at all indoor ranges. AmmoMan.com helps you price compare by offering free shipping for all orders over $99. It's a great deal that only gets better as you buy in bigger volumes! Solid product delivered ahead of schedule. Great experience. I have heard people say that various steel cased ammo (of which Wolf is my favorite), can result in stuck cases. This CAN occur if one shoots quite a bit of steel cased ammo and then goes to brass cased. The steel cases don't expand like the brass case and can leave a bit of carbon residue in the chamber which when a brass cased round is then fired OCCASIONALLY it can result in a brass case becoming stuck. The "fix" is to simply clean your chamber and bore after a lengthy session of steel cased round shooting prior to switching to brass cased ammo. The "doesnt expand as much as brass" situation has also led to the old wives tale of steel cased ammo being "dirtier", it isnt, it just allows a miniscule more carbon past the case into the chamber area. Again, if one is willing to simply clean their chambers and bores as they should anyway this problem will never occur. 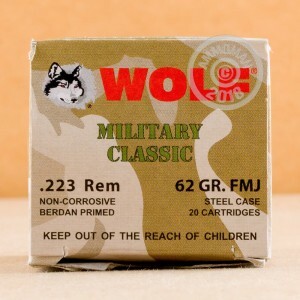 I shoot exclusively steel cased ammo and virtually all of it Wolf 62gr and simply love the performance and ESPECIALLY the price of the ammo. My Son in Law actually is the .223 buyer as I am primarily an AK man but I have seen it proven time and time again about the rare but existant stuck case scenario and the aforementioned happenings is why. This ammo worked fine with no issues at all. I shoot Wolf exclusively through my Windham Govt model.........even use their SP rounds when expansion is needed. Works great and burns no dirtier than any budget priced American ammo and if you clean your gun after a good range session like you are supposed to you will have NO problems. Shoot Wolf in my AK's too and one has well over 20K rounds through it and the steel cases have caused NO problems with the chamber. I do still only rely on chrome lined bores and chambers for my "fun guns" so perhaps that is the ticket. I love this ammo and REALLY love the price. Great stuff!! Wolf ammo is cost effective!! Received the order in two days. Broke in my new DPMS AR-15 Carbine with the rounds. No FTF or FTE' s. I am rather new to sport shooting and and have never bought ammo on line, in bulk or Russian ammo. I didn't understand what folks really meant by dirty ammo. Being a Poly coated jacketed ammo and not shimmy brass it was a little dirty on the hands but hey, your shooting, not in a suit or typically business casual. I had more gun cleaner and oil on my hands than anything else. I can't say powder wise it is anymore weapon clogging than any other ammo I have used. Overall well pleased and even though I have 4 gun shops within 2 miles of my home, I didn't have to get out to get it, it was delivered to the door and after shipping was still cheaper. Really like Ammoman, will use them again. Bought a box to try. Ran 250 rounds at the range this weekend and could not be happier. Not 1 malfunction and kept POI of my red dot perfectly when confirming at 25, 50 and 100 yards. I am shooting out of a 16 inch 1/9 twist barrel. Ran 250 rounds this past weekend for a class, not problems at all. I have used this ammo in my DPMS for over a year. I have no complaints. Shipped it faster then I expected . Shoots cleaner then other older Russian ammo I've used in the past .Every round went bang with no problems in Colt AR HB National Match or Professional Ordinance AR style pistol .Still was pretty accurate both firearms for "Plinking" ammo the Colt was at about 3/12 inch's at 100 yards .